The official PS3 Wireless Keypad from Sony is, in essence, a miniature Bluetooth keyboard designed exclusively for the PS3 and is a great addition to your PS3. The layout of the PS3 Keypad is standard QWERTY with the number row at the top. The casing of the unit is shaped to fit flush with a SIXAXIS or DualShock 3 controller, held in place with a spring-loaded clamp on the Keypad's back. Once synced to the console, via a USB cable, the PS3 Wireless Keypad operates on a fast and reliable Bluetooth wireless connection, with over 30 feet of effective operating range. The built-in, lithium-ion, battery charges via USB cable from the PS3 console itself or any other powered USB port and can be charged during use. The Keypad also offers several features and advantages over a standard USB keyboard. Features such as, shortcut keys to XMB functions, extended range, small size and the ability to be used while playing a game. When the Keypad is in use, the standard controller driven on-screen keyboard on the PS3 is stripped down and takes up less space visually, transfering most of it's functionality to the Keypad. This combined with the ability to type and use the Keypad as a 'mouse' greatly ehances your ability to surf the web and control the XMB. Further enhancing the Keypad's benefits with the XMB, are the shortcut keys. 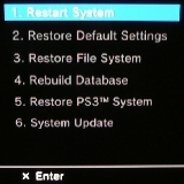 Located beneath the QWERTY keyboard, these XMB functions include fast access to the Friends list and Message Box, as well as other online functions of the PlayStation Network. The 'cursor' button beneath the keyboard switches the entire keyboard to Touchpad mode, responding to finger movements across the surface of all the primary alphanumeric keys. The left and right arrows function as left and right mouse buttons. This can be useful in the web browser as well as the XMB itself, though its accuracy and responsiveness are not well-suited to delicate or precise operation. While most of the Keypad's functions may be trivial to some, it can be very helpful with the XMB's cross-game text-chat features. The XMB chat rooms continue to run during gameplay after being hidden with the PS button, and incoming messages show up in XMB alert boxes in the the upper-right corner of the screen like Friend sign-in/off notices. This makes text chat very convenient between multiple PSN users, even during different games. New messages received in the chat room will display in the corner of your screen, and pressing the PS button will instantly bring up the full view when you wish to respond. While the PS3 Wireless Keypad is not an essential device, PS3 owners who use a USB keyboard or chat with their friends frequently, should find this accessory incredibly enjoyable and useful!